Angry migrants burned down their refugee centers in Dusseldorf after the complex ran out of Nutella and Gummy Bears. A hall which was being used as a refugee centre was burned down because angry migrants were furious about the lack of Nutella and gummibears, it has been claimed. The building was completely destroyed in the fire, which caused an estimated €10 million in damage. Two men have been charged with setting fire to the centre in Düsseldorf on June 7, prompting an emergency which left 26 people injured. German newspaper Das Bild has revealed that groups were angry when chocolate spread and confectionery were not available after dark, despite it being available during the day. Meals at the centre had been cancelled because of Ramadan, when Muslims do not eat during daylight hours. Protesters shouted: ‘There isn’t enough Nutella, Gummibears and chocolate’, the newspaper reports. 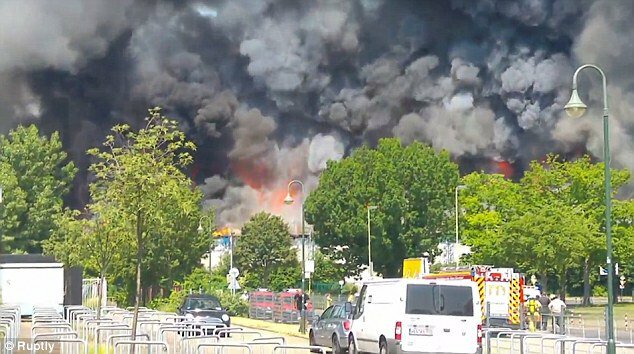 In June Muslims torched the Dusseldorf Center during a fight over Ramadan meals.